Pages 2 and 3 from this storyline are based on the theory of gravitation of this site, described in page 3, 4 and 5 from the storyline NEKG (NEWTON EINSTEIN KIEKENS GRAVITATION). 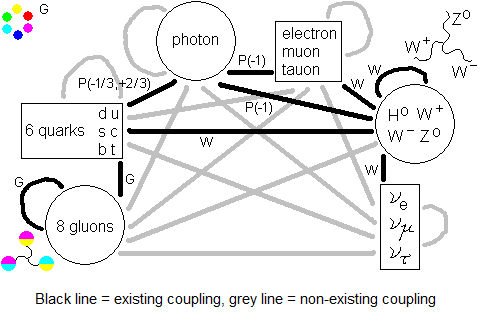 The storyline QQD (QUANTUM QUATERNION DYNAMICS) replaces the colors of the strong nuclear force by quaternion units and page 2, 3, 4 and 5 of the storyline QG (QUATERNION GRAVITATION) uses this to describe the vacuum marbles as quaternion unit particle pairs - pairs of gluons we take them to be. Only paragraph 2 of this page uses the quaternion description of the vacuum intensively. You can skip paragraph 2 and read it later. We go for the view that dark mechanics, ruling dark matter in dark vacuum, is in fact bright mechanics, the film of events being played backwards. Vacuum streams out of a dark star. Still we “see” a planet orbiting it, a dark planet. Against the outflow of vacuum it deviates its track towards the star. Dark mechanics. Antimatter mechanics. We don’t actually see it violating laws of mechanics, not in the light of its dark sun. For more about the visibility of dark matter, see page 4 in the storyline FORWARD BACKWARD TIME DIRECTION. The left picture here is fig. 5 from page 1 of storyline NEWTON EINSTEIN KIEKENS GRAVITATION. There the inward flow of vacuum adds a velocity increment to the blocks that go with the flow. In the right picture, as to speak, outward flow of vacuum removes velocity from the blocks. As if there is a hidden supply of velocity (in equal amounts in both directions, carefully adding up to zero) from which the outward stream of vacuum erases one. The complement velocity, directed towards the dark star, remains and pushes the planet a bit towards the star, thus forcing it in orbit around the star. A laborious formulation, but using the view of vacuum flow, I see no other way to create the film of events in backward time direction. But then again, in the picture given at page 3, 4 and 5 from the storyline NEWTON EINSTEIN KIEKENS GRAVITATION, when gravity is in action, space is disappearing. Shells of vacuum marbles after rearranging have smaller surface than before rearranging of the vacuum marbles. Space is shrinking when gravitation is in action, observable by all things “floating” in the vacuum being dragged by it. In the dark matter Higgs marbles are emitted in the course of backward time evolving renormalization. The new Higgs marbles - after conversion to gravitons, see QUATERNION GRAVITATION page 7, paragraph 2 - constitute new vacuum marbles that are immediately absorbed by the vacuum, enlarging it by their volume. Space expands then. Despite we observe the orbiting dark matter (in so far we can observe dark matter) being dragged by as if space was shrinking there (caused by the “erasing” of velocity), space in fact is expanding there. There is more space between them and us, the number of vacuum marbles connecting them and us has grown. Reconsider the two-picture scene in item 12 at page 1 of this storyline. This scenario is not wrong when performed in forward time evolving vacuum alone. That results in repelling gravity that observably doesn't exist here. What is meant to depict backward time evolving gravity is to time-reverse the process of sagging-in shells of gravity and to do so in backward time evolving vacuum. At this page only this paragraph uses the quaternion description of the vacuum intensively. You can skip this paragraph and read it later. 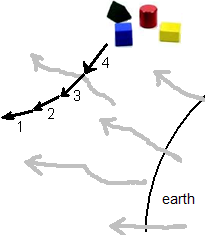 In this site is assumed there is forward time evolving vacuum and backward time evolving vacuum, separated by the time border. At page 1 of the QG storyline vacuum is treated as a sea of vacuum marbles. At page 2 up to 5 of QG is described how the vacuum marbles are filled in with gluon pairs, the colors of the gluons described as quaternions. It must be then that also the computation rules at both sides of the time border are different. (a) and (b) together forces us to set equal * 1 * 1 = * -1 * -1 = * -1. Swap all signs in one set of rules, that gives the other set. Another way of stating this is: start with our rules and multiply every factor with -1 (multiplying with -1 reverses time), this gives their set. When they multiply every factor with 1 according to their rules, one gets our set back again. As observed by us, 1 is the factor that reverses time in their world. and in the last line one recognizes the vacuum marble pair ( i -i ) yielding -1, the backward time evolving vacuum as observed by us. Maybe the neutrino field, eventually considered to establish the arrow of time, has nothing to do with it. A little more about square root -1. So the square root of minus one is extracted here without introducing complex numbers. The outcome is minus one. And you have to do it there, not here. In backward time evolving vacuum as is supposed to be present in dark antimatter galaxies. You have to do it there, but observe it from here, not there. As observed by them it is here that the square root of minus one is extracted without the use of complex numbers. There is little difference between forward time vacuum and backward time vacuum. The vacuum neutrino field swaps spin. The multiplication rules swap sign. See also item 14 of previous page, however still in the colorshift interpretation and under construction. A similar problem like this in item 12 of page 3 of the storyline FORWARD BACKWARD TIME DIRECTION is the following. Imagine a large shallow lake with in the middle a sink drain. Water violently flows away through the drain, causing a radial stream of water onto the middle of the lake. We assume the radial stream is without vortex. (I am not sure this is feasible with a real lake, but assume it to be so here.) A jetski circumvents the drain. With constant speed it steers straight forward and perpendicular to the stream. The stream drags it sideways toward the drain. The velocity of the jetski is precisely such that the jetski nor escapes nor is dragged in. The jetski keeps on circumventing the pool at constant distance of it center at constant speed. Maybe more advanced techniques hint for a solution. Observed from the dark planet - time runs the other way now - there is nothing special there. Vacuum is flowing into the dark star, it drags the dark planet along with it and because of the planet’s velocity it orbits the star. They experience themselves as bright. If they look up to the sky they see us, our kind of matter, as being dark. They don’t see us. So they don’t have to observe the earth’s velocity to deviate towards the sun while vacuum is streaming out of the sun, as they observe it. What happens when the bright mass measures e.g. 7 units of mass and the dark mass 3 units of mass, and then they pass by each other? Using the view of the conveyor belt connecting the masses, now 7 units of length of vacuum flows into the bright mass against 3 units of length of vacuum in the same time flowing out of the dark mass. The flow between the masses decreases distance with 7 - 3 = 4 lengths in the same time, constituting an attraction. The force is considerably smaller than with Newtons gravitation law between bright masses. Now shift view to the 3-units dark mass, so it is bright now. Time runs the other way now, the 7-units is dark now. We see 7 units of conveyor belt streaming out of the 7-units dark mass against 3 units streaming into the 3-units bright mass. The 7-units wins but since its surrounding vacuum is dark it erases velocity. So the gravitations subtract but then is still attractive because the dark vacuum erases velocity instead of adding it. This is laborious, but I see no other way to make things fit. Imagine a dark snowball, an antimatter snowball of 5.97 kg. From the depths of the void it had made it to the earth, just above the atmosphere. The mass of the Earth is 5.97 * 10^24 kg. Imagine the conveyor belt. 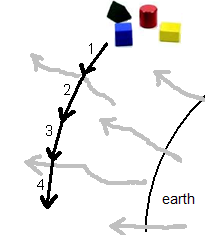 For every 10^24 meters of conveyor belt streaming into the earth, is there about 1 meter streaming out of the snowball? In The calculation of the time border will be derived that the time border around such a snowball is not there. There only are very tiny time borders around each quark. As far as is concerned their mutual gravitational influence, even the antiquarks react bright at the Earth surface. This doesn't withhold the gravitational force from the dark snowball to be repulsive, as observed from our point of view. As observed by us, the quarks the snowball consist of, emit to the Higgs field, causing expanding shells, a repulsive gravity. As long as this enlarging of space is behind the time border (behind from our point of view), it erases velocity. However, very soon it has passed the time border around each quark and then it is just repulsive gravity that is left. And now for the formulas. To imagine what happens, keep in mind two things. which is just the well-known gravitational law F = G * M1 * M2 / r multiplied by r/r, a unit vector made from the vector r that points from point mass M1 to point mass M2. Instead of this we better use gravitational field strength g (gravitational force on a point mass of 1 kg). Set M2 = 1 kg. In this site we will use g/G and equal that to M1 / r times the unit vector r/r. This is the field strength around M1 (and caused by M1), r is the vector pointing from a point you want to know the field strength of to M1. With this formulas we are not yet able to reproduce (4.1) and (4.2). It is not true that between two planets of equal mass, one bright, one dark, at every point the amount of sagging-in cancels the amount of expanding-outward. (So when a planet rotates sufficiently fast around its axis and the planets are near enough to each other, then tidal effects are expected!) But one can image that, from the vacuum between the planets, the total decrease of vacuum by the bright planet cancels the total increase of vacuum by the dark planet. And since the amount of vacuum between them doesn't change, their relative distance is maintained. The actual effect of the gravitational force from dark matter is repulsive only in bright vacuum. In the dark part of the vacuum it erases velocity. Are the orbits of the masses elliptic? And if velocities too high, hyperbola's? r being their mutual distance, G = gravitational constant. When m-bright = m-dark then F = 0. Mechanics, dark and bright together. When m-bright = m-dark then F = G / r , which for planets is also about 0. If (4.1) is right, then a particle and its antiparticle don’t annihilate under the force of gravity since particle and antiparticle have equal mass. They exert no gravitational force on each other. When (4.2) is right, a particle attracts its antiparticle by a gravitational force F = G / r , becoming as strong as the particles are permitted to approach each other before actual annihilation. Regard again the two identical planets M1 and M2, one bright, one dark, and suppose them at rest relative to each other. As said, they stay at rest relative to each other. The time border between them necessarily is the flat plane halfway between them, perpendicular to the line connecting the planets. Regard the point at the bright side (in bright vacuum) nearest to the cross point of the connecting line and the time border. There the force of both planets are equal and work in the same direction. Everywhere along the route from M1 to M2 the acceleration is the sum of accelerations working in the same direction and proportional to M1 / R + M2 / r . When free floating and put at rest relative to the planets, a test mass m cannot remain standing still on the time border. When starting speed was just a little higher, we observe mass m to pass the time border and fall with increasing speed to the dark mass. Mind, at the dark side the force erases velocity. Finally m collides with the surface in a matter-antimatter explosion. But well, it is not precisely an explosion. In fact m doesn't fall to the dark planet, despite we observe it so. Evolving backward in time we know m being launched from the surface of the dark planet. As they observe it, in an anti-entropic fashion an antimatter mass m is “drawn from” their planet's surface and speeds upward, reducing speed while climbing. Since free floating, matter mass m, as we observe it, reduces speed when climbing to end at some none-zero speed at the time border. It ends its evolution there. It clicks on to the course of events of mass m at our side being launched towards the time border. To be frank, mass m has no natural source at M2. So at the time border there exist a superposition of all possible ways m could have come to existence there. From the superposition then is taken the most likely event, that's the way it usually happens. The described course of events is not the most likely, maybe. Similar considerations are made in The time border, page 4 of FORWARD BACKWARD TIME DIRECTION, and page 6 and 7 of the same storyline. Skip “The diamond” at page 5. Imagine bright planet M1 and dark planet M2 sufficiently far from each other to cause no significant tidal effects. Suppose the planets don't rotate around any of their axes and just hang there motionless with respect to each other. Where the line connecting their centers crosses the surface, a platform is laid, its perfectly flat surface precisely perpendicular to the connecting line. A bouncing ball with sufficient energy bounces up and down between the platforms, from planet to planet all the time. But no, let's not start with such an entropic thing as a ball (temperature rises in an atmosphere, radiation is emitted in empty space). We start with one single particle. No, we start with one single photon. We know its speed and it has no trouble with the antimatter composition of the platform at M2. 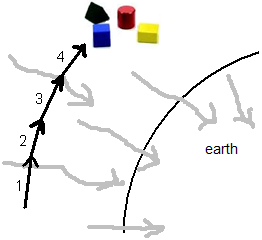 Move the cursor from left to right over the bars to show the mechanism of gravity as proposed in the storyline NEKG page 3, 4 and 5. The left side row of bars, denoted as “Forward” show gravitation, the row of bars at the right side denoted as “Backwards” show the mechanism of expansion of the universe - in fact antigravitation, the gravitation of antimatter. yellow = three dimensional vacuum, consisting of vacuum marbles. For convenience, regard each shell as consisting of a layer of one vacuum marble thickness. At the center of the voids are supposed to reside backward time evolving, dark antimatter galaxies. Take a normal galaxy at the same distance. Telescopes on earth can collect sufficient light from it to form a picture. As observed by us, the dark stars in the dark galaxies absorb light, instead of radiating it. Those absorbed light rays then are assumed to originate at the same places where a normal galaxy would have dropped its light. Assumed is the matter undergoes anti-entropic stimulated emission of radiation there, caused by the backward matter of the dark star. Nor the observation instrument nor our eye is adapted to perceive such a stimulated emission and subsequently to sent a signal to the brain, or the computer. Take atoms - or something - that are at the brink of emitting an entangled photon pair, in a gas, a liquid, a thin sheet of solid matter. The entangled photons of a pair are emitted in opposite directions, normally. Random emission of entangled photon pairs is the same in all directions - I think you have to cool the instrument to nearly zero temperature. But stimulated emission is there only towards the dark stars and dark clouds of dust in the galaxies far away, and in the opposite direction. It is the latter you can collect in the observation instrument to form a picture. Suppose, in the depths of the nearest void is a cluster of galaxies, evolving backward in time. They are immersed in backward vacuum, they consist of antimatter and they are dark. (We follow arguments from page 1 of this storyline, item 9 and further.) Regard a dark star there, with some dark planets around it. The mechanism of gravity in backward vacuum as observed by us, is depicted by the second row of bars. As observed by us, it comprises an outward flow that drags by everything floating in it: a repelling gravity. But mind, as observed by us, in backward vacuum the outward flow erases velocity from the dark masses, still making the dark planets to orbit their dark sun. As observed by them themselves, they are bright. The particles they consist of absorb vacuum marbles and a subsequent inward flow of vacuum drags everything floating in it towards the gravitational centers according to the picture of the first row of bars. The sequence of sagging-in shells proceed outward and finally meets the time border, somewhere in between the void and us. And then, what happens there? The time border itself is a mathematical plane, it does not consist of anything. In quaternions, there are forward vacuum marble pairs equaling 1 and there are backward vacuum marble pairs equaling -1 and that's all there is to a vacuum. 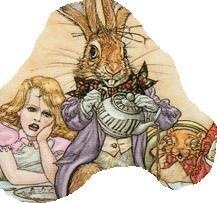 For more about the time border, see page 4 and 5 in the storyline FORWARD BACKWARD TIME DIRECTION. The conclusion of item 12 at page 1 of storyline THE DIRECTION OF TIME is wrong. It is right when performed entirely in forward time vacuum. In backward time vacuum rules dark mechanics, the outflow of gravitational field erasing velocity. The shown conclusions - the pictures - in item 3 of page 1 from FORWARD BACKWARD TIME DIRECTION are restored. Where gravitational sagging-in of shells dominates, vacuum goes forward in time. Where gravitation and expansion equal each other, there is the time border. At the Earth surface, in its own frame one of the antiquarks in an antiproton absorbs a vacuum marble in the course of renormalization. In the antiproton's frame of reference this causes temporarily a very tight bubble around the antiquark with forward vacuum inside. In our frame this bubble is experienced as a backward time evolving vacuum wherein the quark did emit a vacuum marble. The emission causes shells around the quark to expand (the time reversed version of sagging-in). As long as inside the bubble this is a repulsive gravity that nevertheless erases velocity (if there were masses inside). Once outside the bubble, the expanding shells are repulsive gravity indeed. = 1.07 * 10^-19 m.
Compare this to the radius of the proton that is (a little less than) 10^-15 m and the vacuum particles that are supposed to maintain a relative distance of between 10^-20 and 10^-21 m. So the backward bubble “around” an antiproton at the earth surface is about 10 to 100 vacuum particles across and is residing as a tight jacket around the quark that emitted (in our frame emitted) the mentioned Higgs particle. So for 1 antiproton at the earth surface even between the antiquarks the vacuum is still forward. No anti-entropic behavior to be expected there! Only when the number of clumped together antimatter atoms grows, they first conquer the space in the antiprotons, then win backward vacuum in the atom's volume, and finally occupy the space between the anti-atoms and anti-molecules. And then anti-entropic behavior is expected. What happens then is worked out at page 7 of FORWARD BACKWARD TIME DIRECTION. Time border behavior is worked out there. But you better start reading page 4, skip “The Diamond” from page 5 and then read page 6 and 7. An antiproton - its own gravitational field negligible - falls in the earth’s gravitational field just as a proton would do (well, nearly as a proton would do), compare the dark snowball in paragraph 3. And likewise when an electron-positron pair emerges, they are supposed to be separated from the first moment and to obey forward vacuum behavior. And what if the pair does coincide? The proton mass is about 2000 times the electron mass and at the earth surface the distance r becomes SQRT 2000 or about 50 times smaller. So by “coincide” we mean: within a distance of about 10^-20 m and this is near to the highest resolution the vacuum marbles can support. The electron absorbs Higgs particles from the vacuum. 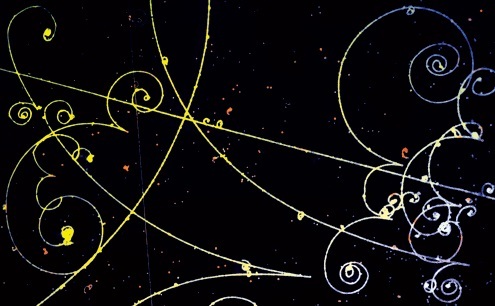 The positron inside the time border, as observed by us, emits Higgs particles at the same pace. As a consequence the composite does not absorb nor emit Higgs particles and thus is massless and has zero gravitational field. Since the particles have no mass, they immediately gain lightspeed. They force each other along the same path, because the slightest separation (10^-20 m) would separate the forward and backward vacuums and then the electron and positron would get mass, for which the energy is lacking. By now the composite is resembling the photon too much to ignore. See more about it at page 4 of the storyline NET FORCE IN QED. If this is the photon, then also the gluon might consist of a quark and an antiquark, massless coinciding. The spin-story would be identical. The electric charges would cancel likewise. If the taste of a quark is u, then the taste of its antiquark must be anti-u, and u and anti-u should cancel then to zero taste. See more about this in paragraph Meson exchange and especially Four quarks in the shell at page 5 of the storyline NET FORCE IN QCD.